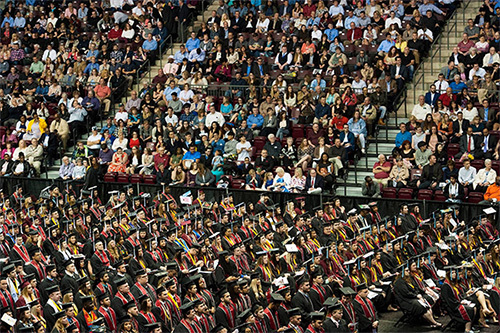 To accommodate all of our graduates, we held three commencement ceremonies this year. It was an honor and a pleasure to preside over each. Last month, I provided to the university’s Council of Trustees an overview of the academic year. This was just a few days before commencement. I’d like to share those remarks with you, too. After all, as a member of the IUP Leadership Society, you are an investor and stakeholder. I’ve added links to some of the items, to provide context and so that you can follow up on the details, if you wish. By all means, please leave a comment below. What you think matters. When we opened this academic year, I emphasized to our faculty and staff that their work matters and that it has impact. I told them that it’s sometimes difficult to recognize the impact, because like a big jigsaw puzzle, IUP’s work takes place across a continuum of people and time, with smaller pieces fitting together to make a big picture. Milestone years tend to make you ruminate during quiet times, and as I finish my fifth year at IUP, I see impact everywhere I look. We started out this academic year buoyed with the reaffirmation of accreditation and ready to tackle big challenges—and we’ve proven that we can, indeed, do so, together, as a community of remarkable students, faculty, staff, and alumni. Several times this year, in different venues, people have heard me refer to the IUP Way. That’s what it means—that we face and rise to occasions together. That’s not to say that we haven’t had real challenges. We have. Excessive partying, the region’s economic development, the strike we weathered last fall, and dynamics of state government and the State System Higher Education are on the list. After all, problems and challenges also are part of the continuum, and just because we haven’t solved them all doesn’t mean we haven’t made progress. Indeed, we are working to turn them into opportunities. Partnerships are important to an organization as complex as IUP, and I couldn’t be more pleased at how the IUP Alumni Association, the Foundation for IUP, and the Student Cooperative Association have actively sought ways to improve the IUP experience for students. Our incredibly generous and dedicated faculty and staff, in addition to their work every day, has set a new all-time participation rate in the University Family Drive. Because of that kind of support, we have students who rise to challenges, take leadership positions, and generally prepare for what they will encounter after graduation and beyond. Every faculty and staff member of this university has a different day-to-day view of the continuum, but the one common focus each of us has is facilitating a superior student experience. Many other important things come out of all that work, but the student experience is the epicenter. Our people work hard, and I am grateful for all they do. I hold up the transformation of the Punxsutawney campus as one example. The new programs that I mentioned are another. Life cycle maintenance and new construction projects are yet another. In fact, so many projects will be underway this summer, campus might be difficult to navigate. Alumni relationships and fundraising also contribute to that superior student experience. Connected to our comprehensive campaign, we have, in its leadership phase, recruited and welcomed more than 90 volunteers to serve in an advisory capacity to each of our colleges and the athletics department. Most are alumni, but not all. As of March, we had in hand between $15 million and $16 million dollars in gifts, with several large proposals under consideration. As we press on toward the next fiscal year, we continue to focus on our fiscal challenges, too, balancing our budget for next year, within about $400,000. At the moment, we are projecting an enrollment of 12,705 for the fall, but the actual number could be higher. As we await the results of the State System of Higher Education’s study internal study, I want you to know that I believe our future is bright. 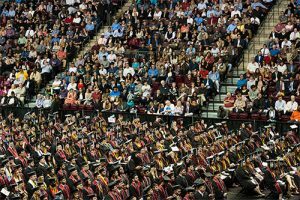 And, on the eve of our three commencement ceremonies, when we congratulate 2,426 students on their rite of passage, I see 2,426 reasons to believe our work has a wonderful impact on the future. So, that’s what I reported to the Council of Trustees the day before commencement weekend. Again, I hope you’ll check in with a comment or question. What you have to say is important. After all, you are very much a part of our students’ experience. Mike these progressive things only happen with great leadership. Mike – thank you for your strong and innovative leadership. You have an outstanding support team (your Cabinet) along with superior Deans, faculty and staff. Over the years, IUP has done much to earn its strong reputation. Thank you for continuing the efforts to strengthen the ongoing mission and the future of IUP.